Oceanfront Building! Just Renovated (fresh paint, new furniture) Entry / Living Room / Master Bedroom / New Queen Mattress in 2nd Bedroom!!!! Our lovely, three-bedroom condominium OCEAN SIDE sleeps as many as eight with our sleeper sofa. A washer and dryer room is a terrific addition for your vacation. Our condominium is located on the top floor with a beautiful sky light. Two elevator's provide access for your convenience. We have a screened-in porch as well as a small balcony off the master bedroom. In the family room we have a new, 27-inch, stereo TV with a DVD player. A 24-inch flat screen TV is in the master bedroom, TV with local channels is in 2nd bedroom and a TV in the 3rd bedroom has ability to play video games. No smoking is allowed inside the unit and no pets. Pelican's Landing on Shore Drive is only a very short walk from the popular Ocean Annie's Beach Club and the Apache Fishing Pier. Bike rentals are near by as well as our on-site pool and a secondary pool which is available from our sister condominium units across the street. Barbecue grills, picnic tables, oceanfront gazebo, pool lounge chairs, and luggage carts are all there for your use. GREAT LOCATION!!! Shore Drive is considered a 'FAMILY ZONE' area. Shore Drive is a dead-end street, which reduces traffic. 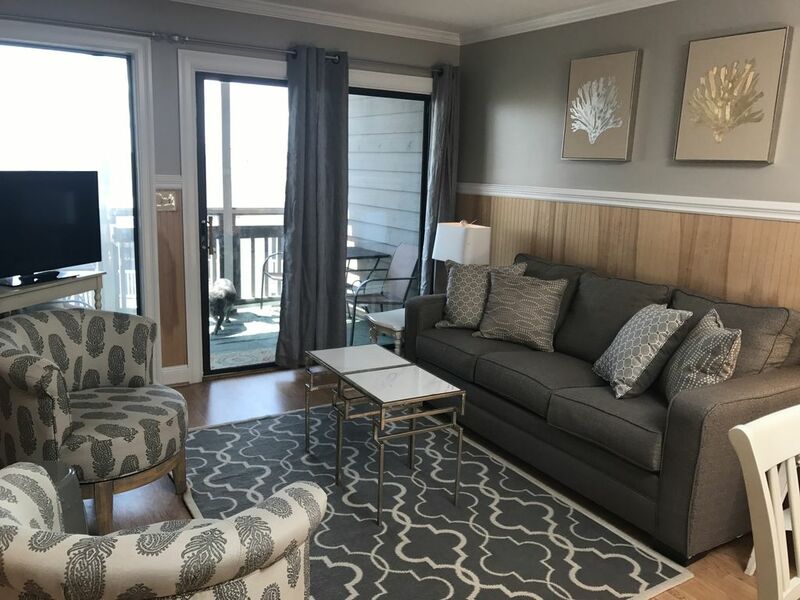 Barefoot Landing, Restaurant Row, and Broadway At The Beach are nearby as well as Super Wal-Mart, and the new Conway Bypass is very easily accessible, along with excellent shopping. We recently remodeled our condo with new hardwood floors / carpet and new decor throughout the entire condo!!!!!!!!!!! We also had new renovations to the living room / entry hall! Wifi available! Sorry per HOA NO MOTORCYCLE'S ALLOWED AT PELICAN'S LANDING-motorcycle's will be towed!